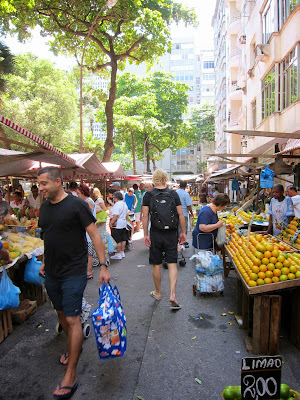 There are a lot of street markets in Rio and they're a nice balance to the less than stellar supermarkets in our neighborhood. 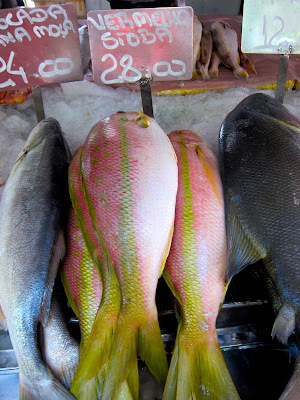 Grocery shopping here is way more expensive than London (bye bye Granola), but there are great deals on seafood, fruits and veggies, especially at the street markets. 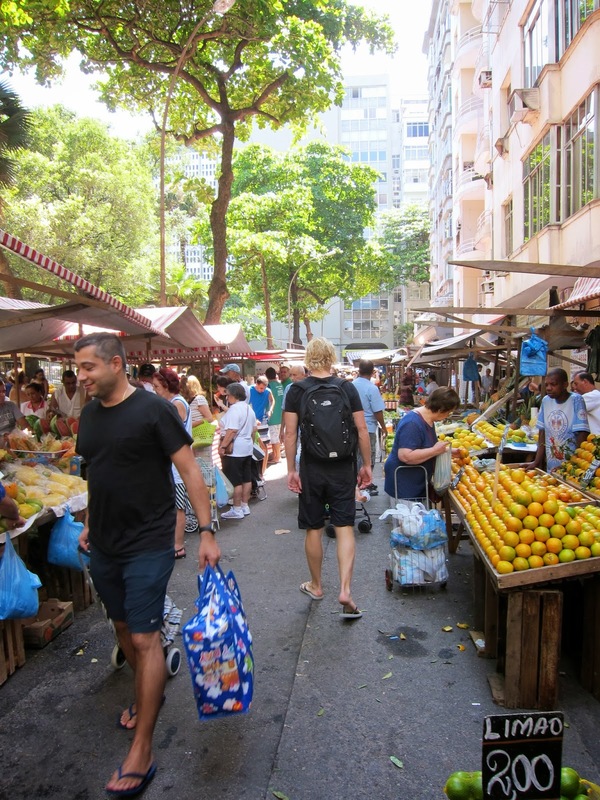 Recently we manage to catch the tail end of a market and scored kilos of fresh veggies at R$1 each. That's 25 cents! Hub and I have visited a few in our 'hood and I think the one in Praça Serzedelo Correia on Sundays is pretty good. It's not on the same level as Barcelona's Boqueria perse, but it's fresh and has lots of character. It's gritty, but we like a bit grit. The seafood here is great and so cheap. Bought a kilo of fresh shrimp for less than £10. Surprisingly there isn't much variety when it comes to fruit and vegetables, but the majority of it is exotic. Passion fruit, papaya, cashew fruit, big banana, little banana...this is the norm. Oh and the bananas taste different, but in a good way. Rio is not big on spice and supermarkets do not sell fresh whole chili peppers. The only place you can buy them is in the markets. How crazy! On our way out, I found this little stand of goodies made from corn. They had tamales de elote, which is a traditional Salvadorean dish. They were delicious, but very sweet. I suspect they added sugar to the mix which is so Brazilian! These little guys greeted us on the way out. Ate proxima semana!